Another work around is to install Adobe's DNG converter and batch convert to DNGs which are not so heavy and can be opened in Affinity. But it's really a schlepp. I see CaptureOne now has support for CR3 files, so might have to go there. I recently purchased Affinity Photo for my ipad pro 12.9 inch. I have camera - Cannon EOS M50 which i have images in CR3 RAW format. I have no idea why "Affinity Photo" is not supported to open the RAW files from this format. Cannon EOS M50 was launched on March 23, 2018 . Now it is 2019 new year, its almost a year going to be, i wonder why "Affinity photo" is taking so much time in upgrading the software to support latest version RAW images. I dont have a desktop Mac. I only have ipad pro with me. Kindly help ipad users to be able to edit RAW images using "Affinity Photo" . If you are not able to upgrade, kindly let me know how can i get refund of the "Affinity photo" app purchased for my ipad. Many thanks ! Unfortunately we don't yet support .CR3 files in Affinity, be that on Desktop or iPad. We're working to include support for this as soon as possible, but I do not have a timescale for this currently, apologies. please support the new RAW file Format CR3 from Canon. Otherwise Affinity Phot is useless for me. Today I tried to open a bunch of .CR3 images on Affinity Photo but they did not work. I did a search for "cr3 affinity photo" looking for a solution and this thread was one that popped up for me. Needless to say, I'm very disappointed to hear that there is not an easy solution and that there is no roadmap for it. I too was looking for an alternative to the Adobe route. Too bad (for us). @Mithferion Is this only the behavior for Mac? or works this for windows beta too? I've downloaded the Windows beta. No, it doesn't work. The RAW Image Extension, like the Mac Core Image Engine, is only in Beta and available on the Insider Previews. It will be a while before it is available and applications will be able to use it. it has been 1 year since the camera relaase and canon start using this new RAW format CR3. waiting the list of supported cameras to be updated with Affinity Photo RAW engine. The Beta version announcement claims to support CR3, but that is not my experience. For what is worth, Apple Mojave can open a CR3 and can edit as well. When I opened a 24 mb file and saved it to Tiff for editing in Affinity, a 24 mb file turned into a 70+ mb file. Canon's DPP system is rather clumsy, so Apple's Photos seem to be the easiest to use at the first stage of editing. I have made this point before: Canon is practicing hocus pocus marketing stuff by claiming the CR3 saves space. 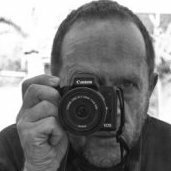 I have used Canon exclusively since 1989, and this is the first time I am making a public complaint (complained to Canon as well). I'll never buy the full version of Photoshop because of Adobe's subscription only policy and Elements does not open the CR3. And why using the TIFF detour here then? - Did you already tried instead to switch the APh RAW engine to the Apple RAW engine one via the APh Assistence Manager settings (on Macs you have this option in APh and thus the choice between those two engines to use) and did it work then directly? You referred to "Assistance Manager settings." I am new to Affinity, can direct me to this function...I have looked and cannot find. The Beta version is supposed to support CR3 but it has not worked for me. Click the Develop Assistant to open its settings dialog. RAW Engine: Provides a choice of RAW processing engines for you to use—Affinity's own Serif Labs engine or Apple's Core Image RAW engine. Lens corrections: Enable or disable automatic lens correction for supported camera lens profiles. Noise reduction: Automatically enables either colour noise reduction, colour and luminance noise reduction, or disables any initial noise reduction. Colour noise reduction is recommended for the vast majority of camera raw images. RAW output format: Choose between RGB (16 bit) or RGB (32 bit HDR) output when developing a raw image. Choosing RGB (32 bit HDR) allows you to maintain a full 32-bit float environment from initial raw development to export and take advantage of extra precision. Tone curve: If the default 'Apply tone curve' option is active, your raw image is adjusted using a suggested tone curve. The 'Take no action' option makes no tonal correction; the image can be altered within the Basic panel later. Alert when assistant takes an action: When checked, a pop-up message appears on loading the RAW image to indicate that adjustments have been applied automatically. Exposure bias: Choose whether to apply exposure bias value if stored in the raw image's EXIF data. Like Histogram stretch, both 'default' and 'initial' give the same results but reports zeroed or actual values, respectively. The 'Take no action' option ignores the exposure bias value. Map default region: Sets the region that displays in the Location panel, if the raw image contains no GPS location data in its EXIF data. 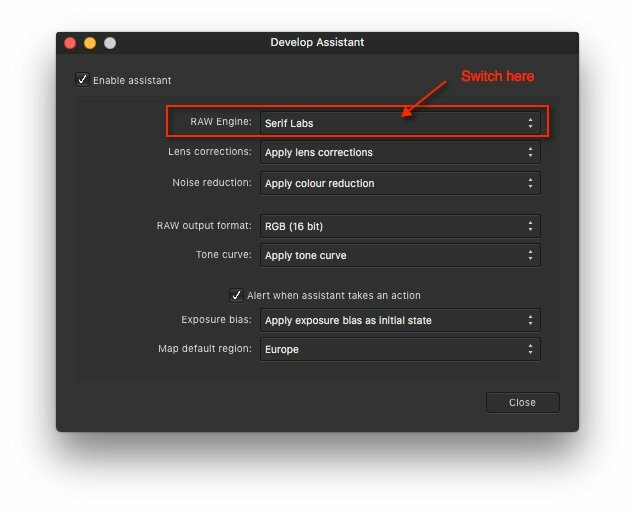 Switch there in the Develop Assistant the RAW engine to use to the Apple one and restart Affinity Photo, then try to open a Canon .CR3 again from APh. I realize Affinity Photo is a pretty damn good program especially for the one time price and that you are working on supporting the .CR3 RAW file, but this delay is not good. I just recently purchased the program for my PC and iPad Pro but now having switched over to the EOS R I'm once again back with the Creative Cloud. The soon to be on sale and affordable full frame entry level EOS RP will be creating more demand for this file format.